With GASTER asking AFW for more matches in order to build her name and stock up on the roster, her latest challenge was on today in form of Yuki Kanno. But, although she didn't do Amateur Wrestling at her school, the Shadow Lord was also a force to be reckoned with when it came to holds. The match was going to be challenging both girls' technical prowess, and the Brit wanted to make sure she came out on top! "My opponent tonight has been absent from this dimension for quite a while, and thinks she can come back at my expense? Mine?! Hah! I will make sure to destroy her and banish her into a microverse that she will never escape from again! Mwahahaha!" Finishing her promo, she would quickly make her way to her corner, taking off her hoodie to reveal the yellow sports bra underneath, turning towards the entrance ramp as she awaited her opponent's entrance. It has been SO long since young Yuki Kanno has been able to step into the AFW's glorious wrestling ring again, she had no idea why management has been unable to book her a match since her last one but at least all the waiting has managed to pay off. Thankfully she spend all that free time doing matches with her wrestling club, which definitely kept her in shape and made sure she'd never rust her skills so that the Crimson Daze will be ready for anything! 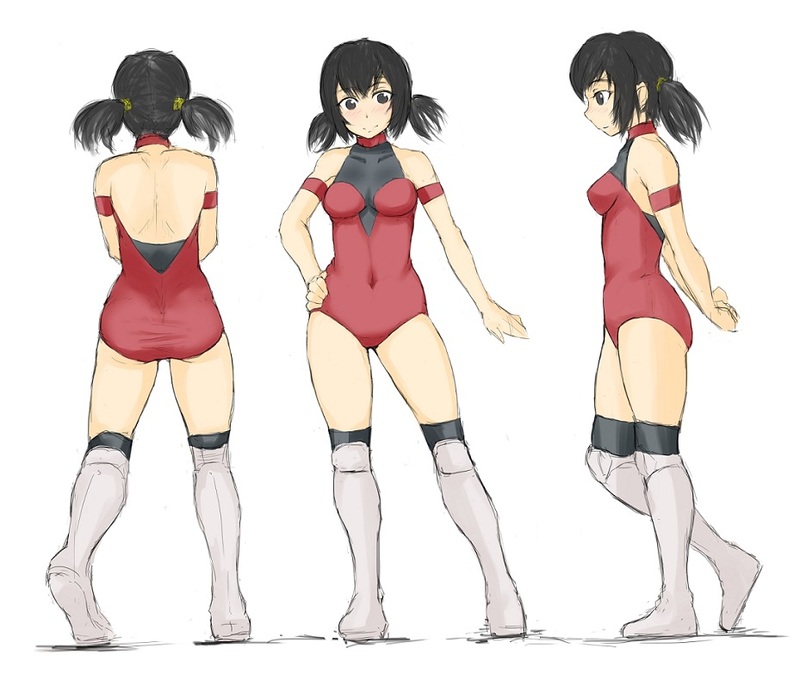 She sat on a bench in the locker room, dressed in her custom made crimson red one-piece leotard with white boots and knee pads, black stockings and red arm bands with a towel around her neck and her pure black hoodie with red spray pant marks on it next to her. Yuki only received a name and a brief description of her opponent for tonight, whom goes by the name of 'GASTER' in all caps and behavior wise is a heel wrestler that wears a mask based off of Mimikyu from Pokemon, joy. The grappler at least hoped this girl wasn't as bad as Haruka Date was, who beat the ever living crap out of Yuki and even knocked her out before winning via pinfall, she still shudders at the thought, along with her friends at the club who were watching wanting to all team up against her. But this was a new experience, and all Yuki wants is a nice fun night, even if the opponent is a heel. ..... She is a freaking chuunibyou, oh boy. Listening to all that made Yuki facepalm and shake her head, she almost wanted to forfeit on the spot. But if she did she might never get another match in AFW again, she cannot risk that by any means. So once the staff called for Yuki to come up to the Gorilla Position, she shook her head and slapped her cheeks to get motivated as she grabbed her entrance hoodie and a red spray paint can then went up to the spot. As the entrance song of the Crimson Daze started to play, electing a cheer from the crowd and especially from the teenage boys in the audience, Yuki waited 6 seconds until the song kicked up before entering the arena wearing the hoodie with it covering her head and standing on the entrance ramp for another 10 seconds with her arms crossed while holding the spray can. After waiting, she puts the can down on the stage and walks down to the ring with her hands in the hoodie pockets, if one can see closely they can see Yuki was nervous. While this may be the usual with her, she was especially extra nervous today as this was her returning match to AFW and didn't want to let anyone down tonight. The Crimson Daze steps up to the apron of the ring, then climbs up the edge before slipping in between the ropes. Yuki walks to the center of the ring and takes off the hood and as she proceeds to bow down to all 4 sides of the audience as they cheer for the girl. She also requests the mic from the ref-girl, holding it with both hands and a slight hint of blush from nervousness as she did. "Hello AFW, it has been too long. I apologize for not being in many matches in recent times, but things happened and couldn't be handled. But now I'm back, and I hope to stay back, because I don't ever want to leave this ring again!" She said as the crowd continues to cheer for Yuki, whom smiles at the welcoming feeling the crowd is giving her. The ref was about to take the mic back until Yuki said she wasn't finished. "And also.." She started to say, as Yuki turns around to face GASTER with a nervous grin and giggles as she boldly addresses her opponent. "You really need to get serious help for that chuunibyou syndrome." She says with a shake of her head as the crowd laughs a little at the remark as Yuki gives the mic back to the ref-girl then makes her way to her corner, taking off her hoodie as she leans against it while waiting for the match to start. GASTER carefully paid attention to Yuki's entrance, with the girl entering in a cute looking hoodie, as she left a spray paint can on the entrance ramp, and made her way down to the ring. Politely, the Japanese girl bowed down to everyone in the ring, before requesting the mic, and cutting a respectful return promo, Clara smiling under her mask, and respectfully listening along with everyone else, with crowd cheering for the return of the girl. ...before she then turned to GASTER, and with a giggle and a shake of the head, taunted GASTER over her...chuunibyou-ness. "Aaah?! W-what?! H-how dare you mock me with that?! Grrrrrr...I'll enjoy crushing you under my dark shadow! ", she would let out...Clara herself huffing under the mask as she turned away from the returning Crimson Daze. She hated having her character disregarded as her being a chuuni in the ring. While she knew she was one, wrestling was a place where imagination like that could run free, she felt. The match officially got under way! Confidentially, GASTER would stomp towards a the middle of the ring, with outstretched hands as she challanged Yuki to a test of strength! Yuki might have gone overboard when she addressed her opponent's behavior while in character as a 'dark lord of wrestling', but just the way she carried herself as she played the role made the grappler unable to resist the urge to tell her off. One thing's for sure though, she can tell GASTER was pissed and not from her speech of being mocked but from her body language. So Yuki can bet this'll be a rough match in the long run thanks to her bold words towards her. She may have felt bad, but she cannot worry about that now as she has a fight to do. Yuki leaned forward with her hands on her thighs as she stared her opponent down as both girls were ready to rumble. The ref-girl made the call, the gong rings, and the match starts up! Right off the bat, Yuki raises herself in a defensive grapple stance as she walks out of her corner. At the same time, GASTER rushes out of her own and goes to the center of the ring with her arms outward aimed at Yuki while not moving an inch. The Crimson Dazes soon recognizes it as an invite for a Test of Strength, which she's happy to accept. While not dropping her guard, Yuki slowly made her way up to her Chuunibyou opponent and just as slowly brought her hands up to clamp together with hers while keeping an eye on her just in case. Then with all her might, Yuki will push against GASTER to give her a taste of her strength and show her what she's got! ...but, GASTER was fully meaning to grapple with her foe to see who of the 2 girls was stronger. ...before the two girl's small frame's collided, as the Test of Strength was on! ...all while firmly taking hold of Yuki's left hand with both of her's, and twisting it, catching the Crimson Gaze in a Wristlock! As the younger grappler came up to her masked opponent, despite lack of eye contact she never took her own eyes off that mask, hoping to get any kind of idea if this is a trick or not. But thankfully, Yuki was able to safely clamp her hands together with GASTER's and once both of the girls' grips were tightly locked they pushed with all they had into each other! It was already an intense test, so much so that both wrestlers got closer to each other with their breasts pressing against each other. This did make Yuki visually blush but it didn't distract her from the current situation with her opponent. Surprisingly they were almost evenly matched, with neither girl being able to one-up the other or make each other move an inch from their positions. Even the crowd was unsure who'd win this test of strength, but at that moment GASTER decided to make a move on the Crimson Daze. In a sudden and quick motion she kicked at Yuki's right hand, breaking the grip and throwing the girl off balance as she used that time to use both hands to twist the arm she still held with a Wrist Lock! With how fast that whole thing went it was hard for Yuki to process what just happened. So she didn't get any chance to counter or anything when her wrist was twisted, having been forced down onto a knee as she grunted in pain. "Heh, that's right! Fall to my might! ", the Shadow Lord would taunt as she continued to twist away at Yuki's arm. Due to the pain from the hold, Yuki fell to one knee, making it much easier for the Shadow Lord to transition into her next hold. With that, she attempted to get behind Yuki, with her arm in toe, in an attempt to get from a Wristlock into Hammerlock as she attempted to bend her foe's trapped arm behind her back! Yuki moaned in pain as GASTER was able to trap her in a simple but effective submission hold. Despite being a Chuunibyou, the young girl had to admit that her opponent has talent and knows how to use it well. So much so that during her time in the hold, the 'dark lord' decided to transition and change the submission up a bit. Having repositioned herself behind Yuki, her arm was twisted around behind her back and was put into a Hammerlock hold while still down on one knee. Going from one submission to another was never a good thing, and this change made Yuki moan louder in pain with her head shot up. Still though, she cannot remain in this for very long and needed to act soon. So, after clenching her teeth, the Crimson Daze pushed herself back up onto both of her feet, and after thinking quick, she'll try and wrap one of her legs around one of GASTER's ankles and pull on it in an attempt to make her lose her balance and weaken her grip on her arm. If this is successful, Yuki will lean herself forward and try to roll forward while trying to wrap her legs around GASTER's waist to pull her down with her and hopefully slam her backfirst against the mat. Using this to both escape from the Hammerlock submission and to counter against the 'dark lord'. Slowly but surely, Yuki was rallying. With her transition, she couldn't keep her rival's leg pinned down for long, as she managed to wriggle her leg out. Still, this at least gave GASTER more space to work on the girl's arm...if it weren't for the Japanese native managing to snake her leg around the Shadow Lord's, and pull on it, the Shadow Lord panicking as her foe manage to unbalance her! In her panic, the hold was severely weakened, and it allowed Yuki to do a full counter of the hold, wrapping her legs around the Shadow Lord to topple her backfirst onto the canvas with a grunt of pain!